Air rifles are favorites for shooting competitions around the world, as well as for small game and plinking. They’re fast, precise, and relatively inexpensive. However, their unique double kickback makes air rifles a hazard to even the nicest rifle scope. You can easily spend $1,000 on a nice piece — only to have it fall apart after a few shoots on your air rifle! 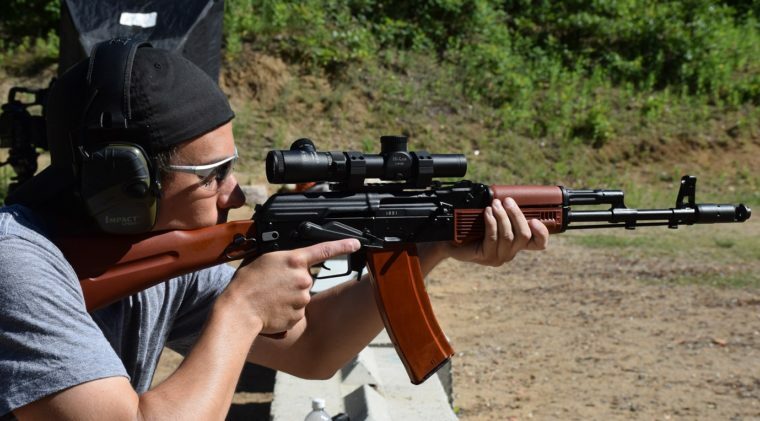 To make any air rifle work for you, you need to equip it with a proper scope. But what makes it suitable for air rifles? It can be confusing, given how many different calibers are used in air rifles, as well as the sheer variety on the market! 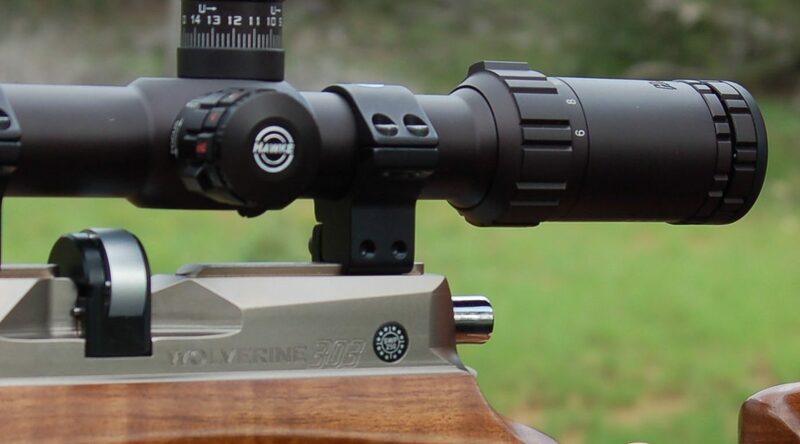 The ideal air gun scope consists of advanced optics combined with rugged, durable parts. Almost all of them claim to be durable, but how do you know which are actually rugged enough to handle an air rifle? We’ve done the research for you, and gone hunting for the best scopes for air rifles. Below, you’ll find our reviews of our 3 favorite choices. Our choices span a range of power and cost. We chose our recommendations for their precision, ease of use, and rugged build quality. 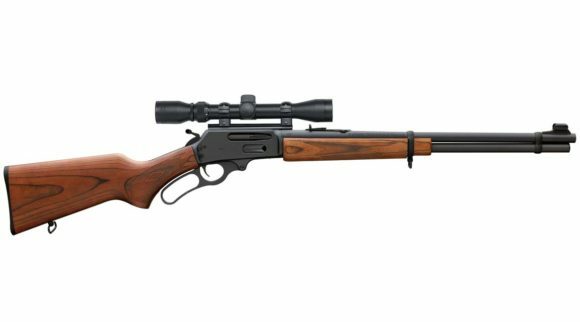 After the reviews, we’ve also included a list of important considerations to keep in mind while you’re shopping and comparing scopes for your air rifle. This is a fixed magnification eyepiece, with a 3-9X-32mm lens set. It’s limited to a smaller range but very effective within it. It has some of the highest reliability ratings because it’s simple and has fewer moving (breakable) parts. It’s one of the cheapest air-gun scopes available, and still has really impressive adjustments including parallax compensation and a reticle that works on the mil-dot tactical system. It has bright, clear imaging with precise adjustments within its set range. We’d recommend it for short-range hunting of birds and small varmints. 3-9X power is enough for most close-range air rifle shooting. It’ll get you shooting 1-inch groups out to 50+ yards, with minimal adjustment needed. Unlike our other recommendations, this one has a fixed power lens set. While that means it has limited parameters of vision, the fixed lenses reduce the number of moving and delicate parts. That makes this one more durable than other scopes–an important factor when fitting one to an air rifle. It’s one less thing to worry about breaking! The fixed lenses also make for a much lighter scope overall. Adjustable options from the same brand add a good 5-6 oz. Plus, this one is designed to be especially compact, long and thin. It’s unobtrusive enough for careful target shooting as well as varmint sniping! For such an inexpensive scope, it has the same basic build quality specs as models costing twice as much! The canister is made from aluminum and completely sealed with O-rings. The interior is filled with nitrogen for fog, water, and shock-proofing. The lenses are also well-built, with sapphire coatings on the outside surfaces. The reticle is especially impressive, with mil-dot markings and coordination with tactical turrets. There are two basic adjustment turrets, for windage and elevation. They’re simple to use, and have pretty solid clicks as you twist them. There’s also an adjustable parallax setting. It works at distances as low as 5 yards, thanks to an AO front lens. We think it’s especially nice at short distances, as many rifle scopes can’t adjust for parallax at such close range. There are some quality control issues with these scopes, and some previous buyers mentioned receiving defective scopes out of the box. That shouldn’t pose any major issues while you’re in the return window, but it’s an unfortunate inconvenience. Sadly, it’s par for the course at this price range. Thankfully, the vast majority of buyers didn’t have this issue. The eye box is fairly small. There’s also not a lot of eye relief. These aren’t huge concerns at .177 or .22 caliber, but it’s definitely an opportunity for improvement. Any fixed-power [eyepiece is inherently limited. This one won’t be great for tight shots past 50 yards or so. 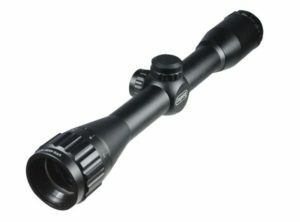 This adjustable magnification scope has a 3-9X power range, for shots out to 300 yards (the edge of what air rifles can do). It doesn’t have a technical reticle, but it does have target-style turrets with precise MOA adjustments. For durability, all of the adjustment turrets are encased in rubber, which cushions kickback. There’s also a lifetime warranty. Reviewers said it’s really robust. We strongly recommend this one for most hunters and target shooters as the best midrange, all-purpose option! Both lenses are fully multi-coated to reduce glare and allow better lighting. That’s an upgrade over the cheaper UTG, which only has coatings on the outer edges. It’s built to stand up to the stress of air rifle shooting. The tube and the lens caps are made of aluminum, and we’re impressed by how sturdy and secure the whole thing feels. We particularly appreciate the rubber inlays in the BSA’s adjustment turrets. They provide a cheap, low-maintenance cushion from air rifle kickback without the premium cost associated with spring cushioning. For further backup, a pin keeps everything at absolute zero when you really need it. Overall, the BSA’s performance under recoil easily bests anything else for the price. 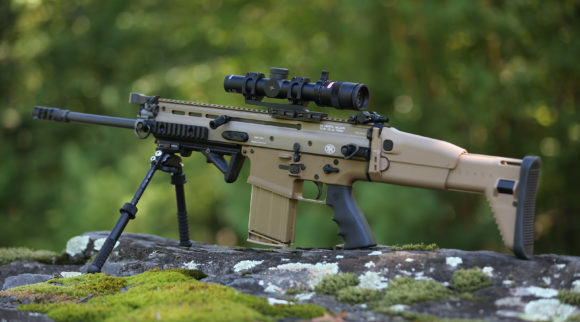 They said that it stands up to heavy recoil every time, and never loses its zeroed-in focus. You can also adjust for parallax with an AO eyepiece. It works down to about 10 yards or so. That’s an advantage for air rifles in particular, since most adjustable scopes are set to be parallax free at 50 yards. It’s also one of the cheapest scopes out there that’s covered by a lifetime warranty. The reticle isn’t technical. It’s a basic duplex design with narrowing crosshairs in the middle of the sight. While it’ll serve the needs of most shooters, it’s not great for calculating long-distance bullet drop or inclines. The lens caps that are provided aren’t clip-on. They screw on with narrow threads, which are fine for storage, but not great for quick access. This one is for the most demanding air rifle shooters! 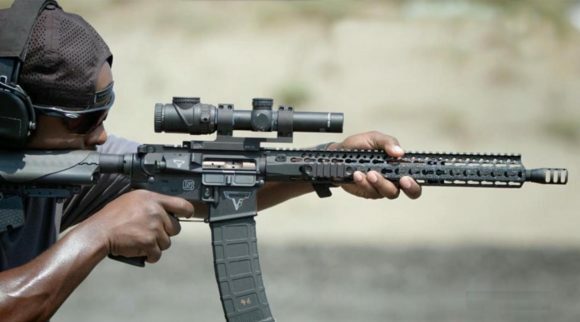 The lenses have a very wide power range, at 6.5-20X, and work with a mil-dot technical reticle/MOA adjustment turrets for precision far beyond other air rifle scopes. It also comes with lots of fancy features like an illuminated reticle, brightness adjustment, lens caps, and lockable/zero-reset turrets. It’s clear, bright, and super powerful–enough to satisfy any shooter! The 42mm objective lens provides a nice, wide field of vision, even at the highest magnification settings. It’s a bit smaller than other high-power scopes, which use 44mm objectives. This allows for a lower, less-obtrusive mounting position. Both lenses are fully multicoated, and rated to work with any caliber of firearm. The illuminated reticle is adaptive and fully adjustable. There are two color settings, red and green, so you can choose what’s most visible for each hunt. Within each color, there are 5 brightness levels to choose from. We especially like the color options, since most reticles only give you the red setting. Green light shows up more easily against some backdrops, so that’s a nice touch. Even without the illumination feature, the reticle is impressive. It works on a mil-dot design, and is fully-floating, so its size stays the same no matter the magnification setting. The 30mm tube is engineered from a single piece of aluminum for structural integrity and better aim along the length of the scope itself. It’s fully-sealed and filled with nitrogen for fog and waterproofing. The adjustment turrets are tactical-style, with exposed knobs. They’re spring-cushioned to maintain absolute zero under air rifle kickback. We love that the Hawke’s turrets lock to prevent accidental jogging. That takes the one major disadvantage of tactical turrets out of the picture! Parallax is adjustable via a simple side knob. It’s adjustable right down to 10 yards, which is particularly impressive for a scope of this power. The side turret is also more precise than a moving eyepiece (which is what our other recommendations have). Unlike our other choices, the Sidewinder is designed to work with any firearm. While it’s missing some of that low-range power zone, it’ll suit up the biggest guns in your cabinet. That makes the price a bit easier to stomach, since you can use it for each hunt! It comes with all the accessories you need for a day in the field, like a hard carrying case, lens caps, and a sun-shade. Reviewers said it’s very good up to the top of the power range, and is built ruggedly. It’s a lot more expensive than other air rifle scopes, and more than twice the price of our other two recommendations. While the magnification range is certainly impressive, it’s missing the low end you’ll find on the UTG and the BSA. It’s not ideal for tight shots up close. 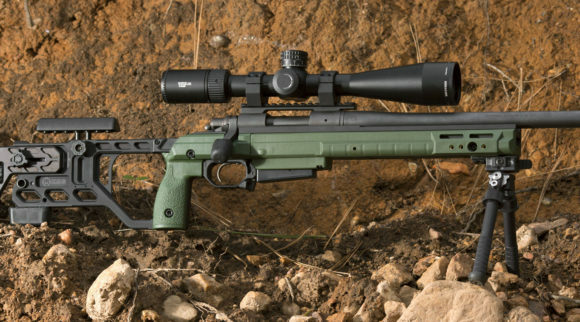 Which scope is best for your air rifle? The UTG is definitely the best choice for close ranges. 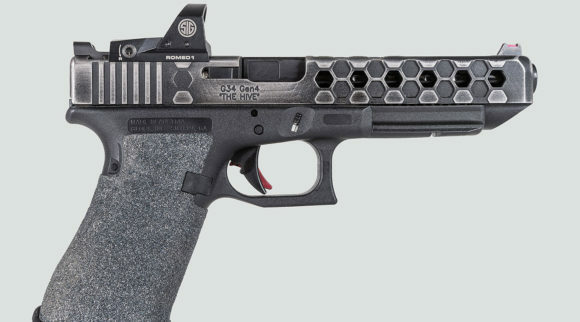 It has the lowest power, but complements its fixed range set with tactical adjustments and a parallax adjustment feature which works at lower distances than the other two. Plus, it’s very inexpensive. If you don’t need to shoot long-range targets, there’s no reason to spend more. The BSA gets you a bit more range without raising the price too much. Its 3-9X power range makes it a good all-around choice for target practice as well as small game hunting. If you want some more versatility without going for a premium option, you should have a look at this one! The Hawke will take you to the edge of what air rifles can do, with an extremely wide power range and tactical adjustments. It’s more precise and powerful than our other recommendations, while still fitting in the mid-range price bracket. The Hawke is probably overkill for the casual or beginning user, though. Air rifles, or pellet guns, fire small, short pellet-style bullets instead of longer rifle bullets. They shoot munitions sized at several calibers. Different calibers shoot at different distances, so you need an appropriately powered scope for each. 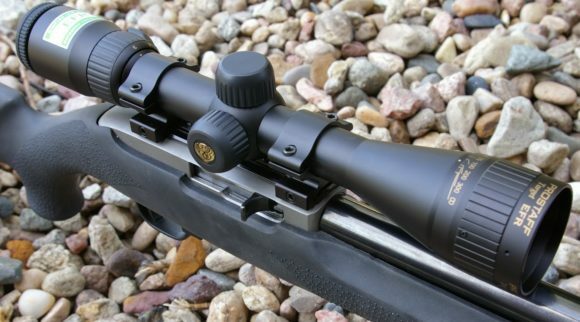 (Learn more about choosing the right scope.) Before you can start considering specific models, you need to know which caliber your rifle fires. That way, you can choose something with the corresponding magnification power. The most common caliber of munitions sold for these firearms is .177. These are the standard ammunition for competitive target shooting in the U.S. and internationally. They have a flatter trajectory than other calibers, and achieve the highest speeds. We’ve based most of our recommendations on this type of ammo. However, it’s not good for hunting anything bigger than a bird or small pest, like rodents. It doesn’t have the size or power to despatch larger prey humanely. The small size means it doesn’t cause lethal damage to any but the smallest game, and the speed means it often goes straight through. So, don’t try to do anything other than target shooting with it. .20 caliber is a middle ground option between .177 and .22. It’s a nice compromise, but is also rarer and more expensive than the other two. It’s good for target shooting, and has a flatter trajectory than a .22, but adds a bit more weight and power to the .177. You could use it for hunting very small game, but it’s hard to find in stock and few weapons are made to suit it. .22 caliber, like with normal rifles, is ideal for most hunting purposes. It can also be used for target shooting and plinking. Suitable prey would be jackrabbits, gophers, pheasants, etc. It’s more effective than the smaller air calibers due to its weight, impact, and size. .22 caliber is prone to a bit of bullet drop, though, so BDC or mil-dot reticles are preferable when using it. That’s also the key reason why .22 munitions aren’t commonly used for competitive target shooting. .25 caliber is essentially the same as a .22, but with more size and weight. These require more power, and the air systems can be expensive. .25 caliber weapons are the best air firearms for hunting, but they’re still not suitable for taking any large game. We haven’t focused on them in our reviews, since they’re quite obscure in the market. Airguns produce a double recoil. The first is the usual kickback, when the piston is released, but then there’s a forward surge as the piston hits the end of the chamber. 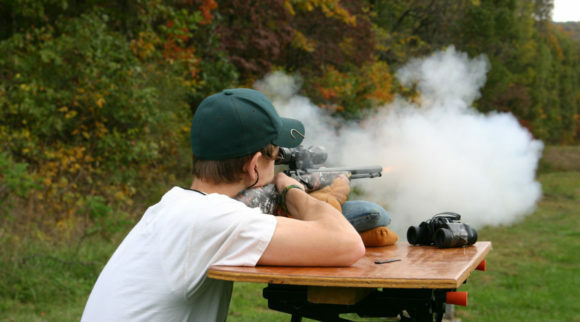 Between the two, air rifles can cause serious damage to normal scopes very quickly. 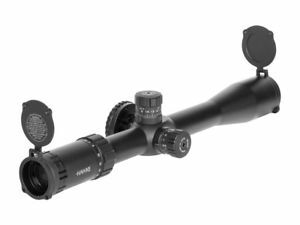 Look for scopes with spring-loaded, lockable adjustment turrets and rubber shock-proofing in the tube. 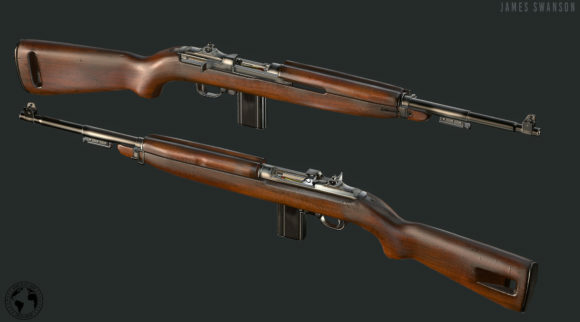 You don’t want to skimp on durability with air rifles, since they’re scope-destroyers! Wherever possible, look for extended/lifetime warranty coverage to back up your investment. 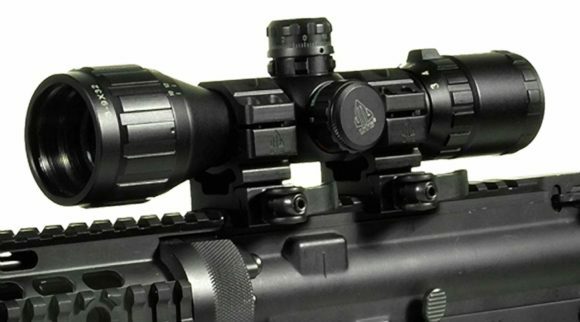 AO means adjustable objective, which helps compensate for parallax at the closest ranges. These features are found on both variable and fixed scopes. 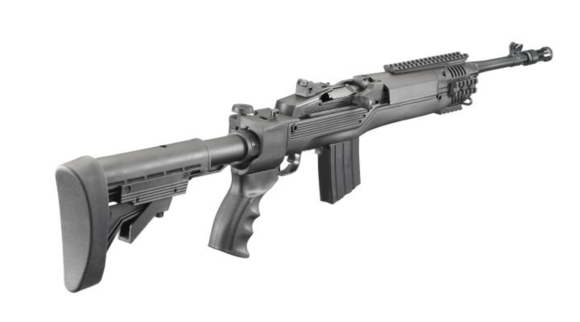 Given the ranges most of us shoot air rifles at, AO’s are a must-have feature. 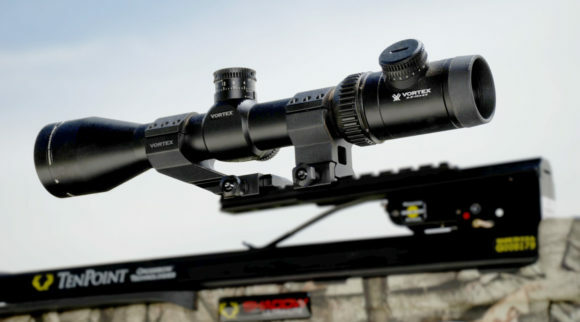 Variable scopes are best for varied hunting and target practice. Fixed eyepieces are only suitable for close-up varmint/small rodent control. However, they’re sturdier and more durable than variable options. You’ll want to choose the setup that best suits your shooting. 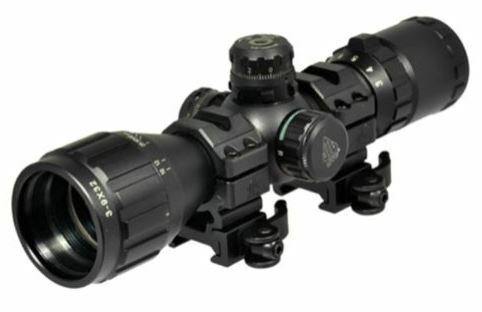 To see more of our recommendations for the best gun scopes, read the Best Rifle Scope Reviews! We have reviews for the best .22 scopes, night vision scopes, and more.